The Kardashian clan is about to get a little bigger. Kim Kardashian and Kanye West are expecting their fourth child via surrogate, a source confirms to E! News. "The surrogate is well into the pregnancy," the insider said. "She is due in May and everything looks good. Kim and Kanye have known for awhile and are very excited. They had one male embryo left and are thrilled it has worked out. Kim always wanted four kids and having two boys and two girls feels perfect. They were very happy with the entire experience the first time and are so grateful to have one more baby." E! News has also reached out to Kanye and Kim's reps for comment. Rumors of the couple's plans for a fourth child have been spreading for about a year. While Kim initially shut down the reports, she later seemed more open to expanding her family. "But I've been really open about it and talked about it on our show, so...I don't know," the Keeping Up With the Kardashians star told E! News in August. "We start filming season 16 next week. So if I think about it more and it's gonna happen, you'll definitely see it on the show. But, as of now, no." However, she said if the couple were to grow their family, a fourth child would be their last. "I don't think I could handle more than that," she told Elle. "My time is spread really thin. And I think it's important that in all couples, the mom gives the husband as much attention as the kids." This isn't the first time Kim and Kanye have hired a surrogate to carry their child. As fans will recall, the two welcomed their third child, Chicago West, via surrogate in January 2018. 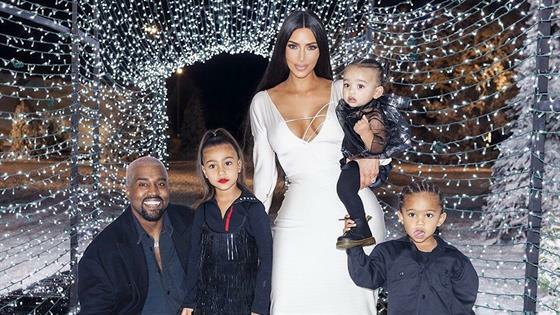 A doctor had recommended that the parents use a gestational carrier after Kim suffered from placenta accreta during the deliveries of her first two children, North West and Saint West. "After giving birth, your placenta is supposed to come out. But mine was stuck," she told the magazine. "That's what women usually die from in childbirth—you hemorrhage and bleed to death and they can't stop it. To get it out—it's so disgusting—the doctor had to stick his whole arm in me and scrape it off. It was the most painful." Still, she had her initial concerns about using a surrogate. "I hated being pregnant," Kim told the publication. "But as much as I hated it, I still wished I could have done it on my own. The control is hard at the beginning. Once you let that go, it's the best experience. I would recommend surrogacy for anybody." Even though Kim's road to motherhood hasn't been easy, another insider previously told E! News "Kanye has always wanted a big family" and that "they both feel like if it's meant to be then it's meant to be." "Both Kim and Kanye always agreed on both wanting several kids and a big family," a third insider previously told E! News, adding that the two had an embryo stored. "They love having their kids run around and be able to grow up and enjoy each other as siblings. They definitely would want the fourth child to be close in age with the others. Family is very important to them."